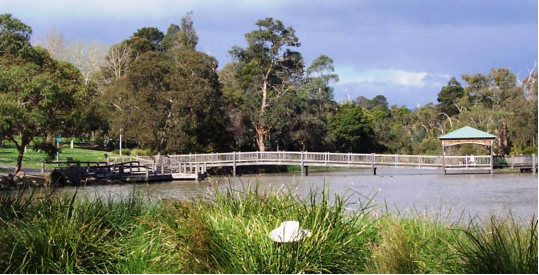 Ringwood Lake Park will be home to Maroondah’s first permanent Changing Places bathroom facility catering for people with a severe disability, with the new toilet block set to open shortly. Maroondah Mayor Councillor Nora Lamont said the new toilet facilities would be a major improvement for the park which is a popular location for walkers, joggers and families making use of the play equipment and barbeque facilities. “It is extremely exciting to see this project commence as there is definitely a need in the area for improved public toilets as the current facility is old and no longer meets the needs of the community,’ Cr Lamont said. “The investment of $300,000 from Council’s Capital Works program will see the creation of a new toilet facility adjacent to the playground. The new location will be fully accessible for people who use mobility devices and is clearly visible from Maroondah Highway,” Cr Lamont said. Cr Lamont said the facility will feature four unisex toilets – two being fully accessible and providing baby changing facilities. “In addition, the works also include the creation of the first permanent Changing Places facility in Maroondah which caters for people with a severe disability,” Cr Lamont said. “Unfortunately standard accessible toilets do not meet the needs of all people with a disability, or their carer, which is why it is so important that we provide Changing Places facilities at key community locations such as Ringwood Lake Park,” Cr Lamont said. “The Changing Places design concept includes a height adjustable, adult-sized changing bench; ceiling hoist to help lift the person out of their wheelchair; extra space to accommodate carers and screens or curtains for extra privacy,” Cr Lamont said. “Without appropriate accessible toilets, many people who have a disability are left with few options when out of their home environment – they have to be changed on the floor of a public toilet; to return home when in need of a change; or to sit in soiled continence pads until an appropriate changing area can be found,” Cr Lamont said. “None of these options is pleasant and collectively they make it extremely difficult for people who want to be able to get out and about and socialise with others in the community,” Cr Lamont said. “So it is wonderful to know that Maroondah will soon have its first permanent Changing Place facility. People who have a severe disability and their carer will now be able to visit the park, or attend events hosted at the park such as Council’s annual Australia Day festivities, and know that their needs will be catered for,” Cr Lamont said. “The facility will also complement the Liberty Swing, a specially designed play equipment which offers people who use a wheelchair the opportunity to experience the joy and recreation of using a swing,” Cr Lamont said. “Knowing that the Changing Places facility will soon also be available, I’m sure the park will become an even more popular destination for people of all abilities,” Cr Lamont said. The current toilet facilities will remain in operation until the new facilities are operational.